Cross Country Skiing, Wrangell - St. Elias National Park, Alaska. 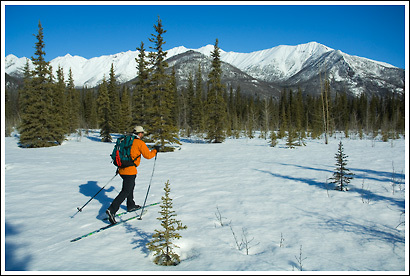 Cross Country Skiing, Wrangell – St. Elias National Park, Alaska. Truth be told, I haven’t been shooting too much these last few weeks. I’m back in McCarthy, at the Shaq, and though the weather has been pretty nice, I just haven’t found much to photograph. It’s the end of winter, in that season known locally as ‘breakup’, a kind of pre-spring interim. The snow is melting, quickly, which means limited mobility – after about midday, its just slushy goo. however, when we get a nice clear sky, at night, the temperature drops dramatically (it’s been comfortably warm in the daytime), and the snow cover re-freezes .. so skiing in the morning is awesome. A great crust forms, and I can ski anywhere. I’ve been up and down the river valley, through the woods, up to Kennicott, up and down a couple of other river valleys, and it’s been simply amazing. I have to be done by around noon, which means a long afternoon of chores, reading, some writing, playing guitar, napping, and enjoying the warm days. Slowly people are coming back to this area, for the summer, and I’ve run into a few folks who I haven’t seen since last summer, and it’s been great to catch up with old friends. But mostly, it’s been great going out skiing every morning. Spring skiing is something else. I’m kind of dreading the time when the snow’s gone, but it’s still too slushy around to do any hiking. Hopefully that won’t happen for a little bit longer, and i can get some more skiing in. The other thing that impedes my skiing is the open water along the rivers .. right now i can still get around reasonably well, but another week of warm sunny skies and these rivers will be completely open water, and not so easily crossable – though, as I always say, where there’s a will …..
PS – oh, as a matter of interest, this is taken about 5 minutes from the Shaq – which is nestled in the woods beyond me. Fireweed Mountain is in the background. This entry was posted in Adventures, Alaska, People, Skiing, Winter, Wrangell - St. Elias National Park and tagged Adventures, cross country, outdoors, Skiing, snow, sports, Springtime, Winter, Wrangell - St. Elias National Park, XC skiing on April 22, 2009 by Carl D.
Spring crust skiing is my favorite outdoor activity. Today might have been our last day here, as clouds have moved in and it may not get cold enough at night anymore. Then comes the worse part of the year – too much snow for hiking, too slushy for skiing, but that is OK, summer will be here soon! Yes that does look great. One question; were you going forward or backward? Mostly, when I ski I go forward, these days. Sometimes I fall down, too.